This Instant Pot Millet and Pinto Bean Chili makes for one super flavorful, healthy, protein-packed and easy to make gluten-free vegan meal! A quick, easy, healthy, delicious, protein packed Instant Pot Millet and Pinto Bean Chili. This beautiful pressure cooker recipe makes for one comforting gluten-free vegan meal! In case I failed to mention it, I'm beyond in love with my Instant Pot. I have the DUO Plus 60; and I use it everyday! Chili was definitely up there on my list of things to develop using the Instant Pot; and I could not be more pleased with this first IP chili creation! It is subtly sweet, spicy, salty, tangy -- it has such deep and beautiful flavors that make it great on its own or served alongside taco night, or as the topping to your baked potatoes. The options are endless. It is versatile, makes great leftovers and is oh SO delicious! If you aren't all that familiar with millet, millet is a seed that is: high in fiber, high in magnesium, high in zinc, high in potassium, raises serotonin levels, high in protein, high in B vitamins, and has excellent heart protecting properties, helps prevent diabetes, and is great for gut health! I adore millet. Combine millet with nutritious pinto beans, veggies and spices and you have one heck of a healthy and tasty meal! I sincerely hope you love it just as much as we do! Soak dried pinto beans for at least three hours prior to making chili.Set Intstant pot to saute mode. Stir in oil, onion, garlic and bell pepper. Saute for 5 minutes, stirring frequently.Stir in spices - chili powder through bay leaf. 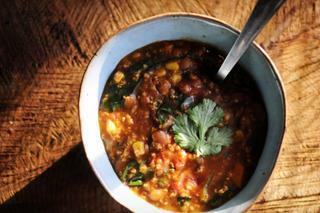 Saute for 1 minute longer.Stir in pinto beans, millet, corn, cilantro and parsley. Saute for 1 minute longer while stirring constantly. Turn off saute mode (press cancel).Stir in tomatoes & vegetable stock.Lock on lid, close vent, and Manual High Pressure cook for 33 minutes.Press cancel and quick release..Stir in sugar, vinegar, greens. Salt to taste.Serve immediately or place in Keep Warm mode until ready to serve.Optionally garnish with cilantro and/or parsley before serving.Enjoy!